Great transaction! Really good price! Thanks! Beautiful chain! Excellent in every way! Even prettier than pictured.Thank You!! 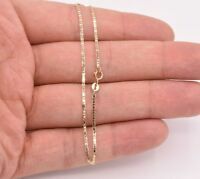 Very nice thin necklace chain. Fast ship! Very satisfied!